Chickens’ nails are similar to humans’ and dogs’ in that they continue to grow and require maintenance. Backyard chickens normally wear down their toenails while scratching and walking on the ground outside, however, some chickens are unable to maintain their nail length either due to awkward anatomical position or from being housed on wire floors or soft litter, in which case, trimming, clipping or filing is recommended to prevent lameness or injury. 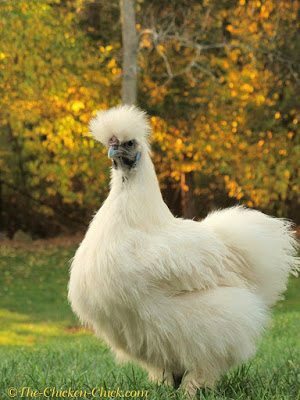 Some breeds, including Silkies, have extra toes that grow in funky directions, requiring periodic nail clipping. A partner to hold the chicken. 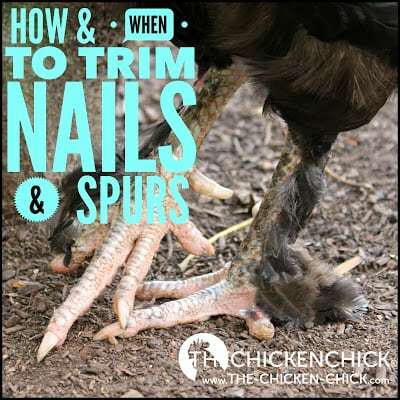 A chicken’s nails contain a vein that will bleed if the nail is cut too far towards the toe, so keep styptic powder at the ready while trimming. In good light, the vein can usually be seen under the nail of chickens with light colored nails. Always trim conservatively to avoid nicking the vein. 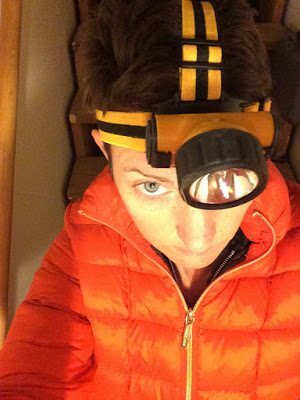 Most chickens don’t care to be handled, so it is easiest to trim a chicken’s nails or spurs well after dark when they’re roosting and half asleep using a headlamp and a partner. 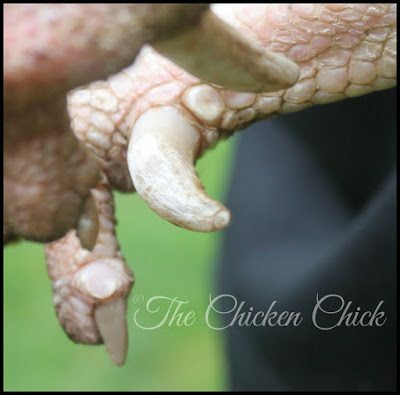 With a partner holding the chicken securely, hold the foot firmly in one hand, isolating the toenail to be trimmed and the nail clippers in the other. Trim 1/4-1/3 of the length of the nail. If the vein is nicked and bleeds, immediately dip the nail in styptic powder and hold gentle pressure on it with a paper towel until bleeding stops. File any sharp or jagged edges. Spurs are horn-like, bony projections that grow out of the back of a rooster’s lower leg that are used for personal defense and flock protection. Think of the spur like a thumb that’s completely covered by a thick, sharp fingernail. A rooster’s spurs continue to grow just as his nails do and if left unchecked, can interfere with his ability to walk, cause injuries to him and others. To maintain a reasonable spur length, the spur cap can be removed or trimmed, however, when the hard outer layer of the spur is removed, the exposed bony tissue may bleed, is very sensitive, if not painful when touched, and is vulnerable to infection. 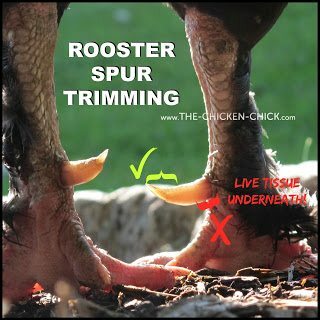 For these reasons, I do not uncap my roosters’ spurs, preferring to trim them instead. 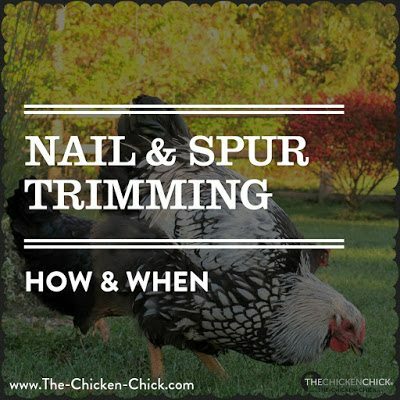 The same method for trimming nails applies to spurs: steer clear of the live tissue underneath the spur cap, cutting only the first 1/4-1/3 of the projection with very sharp, large dog clippers, filing to dull any sharp edges. The spur caps will re-grow. Thank you for the valuable information on trimming nails. I will be sure to check my girls tonight before saying good night to them. I would just love to win the feeder. I have so much waste. My chickens aren’t packing feathers but biting necks and grabbing by the tail . Every morning I let them out of the coup I have a silky rooster that chases the other silky.it runs screaming and hiding .what is this behavior? 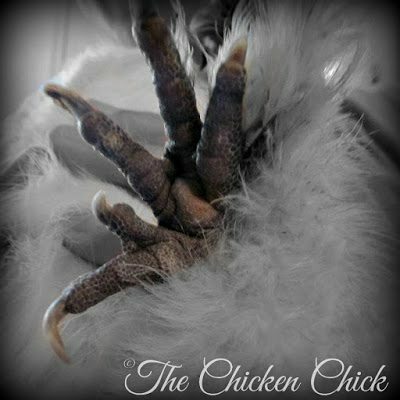 My chickens aren’t picking feathers they are grabbing the necks and biting or tails.when I first let them out of the coop in the morning I have one silky rooster that chases the other one .the poor baby runs screaming and hiding what is this behavior?